The X-Men find out what Arkea is capable of, and the phrase “rampaging horde” comes to mind.Can Arkea be defeated? Can the X-Men take down one of their own, if that’s what it takes?Meanwhile, what’s up with Sublime and Rachel? What’s up with Bling and Cipher? What’s up with Jubilee and Bling? Cover- Psylocke takes center stage on this one and she is the hottest she’s been since Jim Lee drew her way back in the early 90’s. 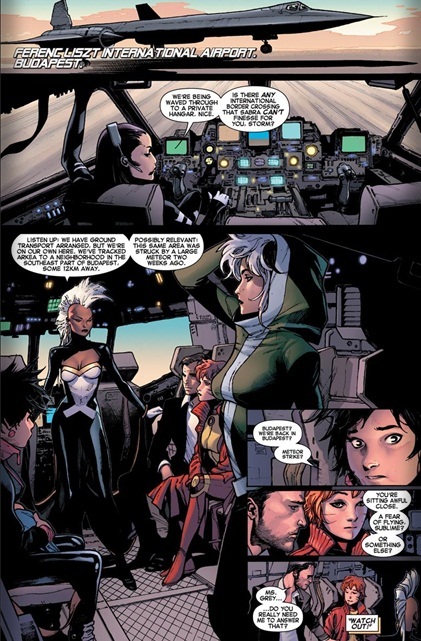 Art- Olivier Coipel’s art makes all these women gorgeous. Storm in particular has this dominant Amazonian physique with striking facial features that make me swoon. Psylocke and Rogue’s features are also worth noting as both have this classic 90’s flair similar to when Claremont and Lee were on the title. Asian Heroes- Psylocke, Jubilee and Shogo represents for the Asians in comics big time in this book! 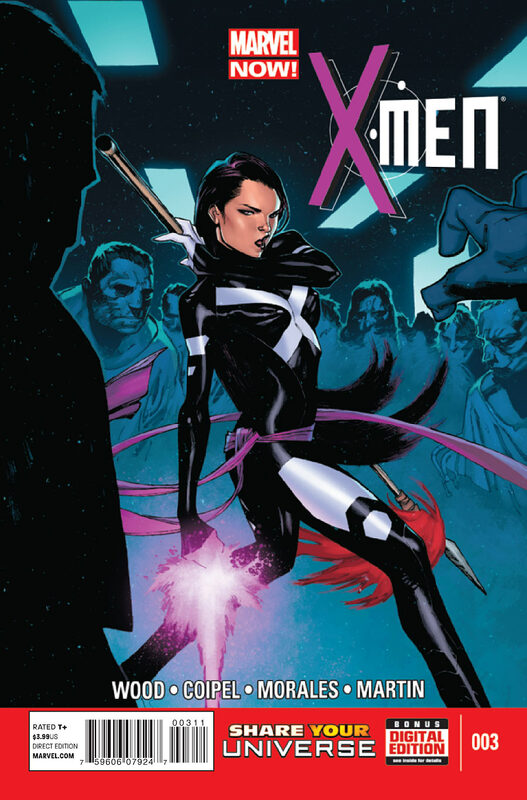 Brian Wood confirms that psylocke’s telekinesis is still active this issue as he has her fire off a teke-bolt and manifest her telekinetic katana which she hasn’t done in a long while. Jubilee meanwhile bonds with her adopted baby Shogo and apparently this will be her new role in this band of femme fatale. Black Heroes- Thank you Brian Wood for writing Storm in a sensible manner far beyond the tokenism of Uncanny X-force, Fearless Defenders, and All New X-men. Storm has a commanding presence and a confidence conveyed through the art second to none. This is Claremont’s Storm in presence and form, all this needs is a spotlight on home girl and this could be almost perfect. Wood has plans for Bling and that bodes well for this underused black superhero in the short time. As long as Wood is on this book she will get some of the spotlight. Lesbian fans can also take solace that Bling is one of the only black lesbian’s in comics nowadays. Oya/Idie Okonkwo makes an appearance though she doesn’t get any lines. Vampire- So Jubilee was a vampire the last time we saw her and her vampirism had changed her personality radically. Wood has all but ignored that detail so far. 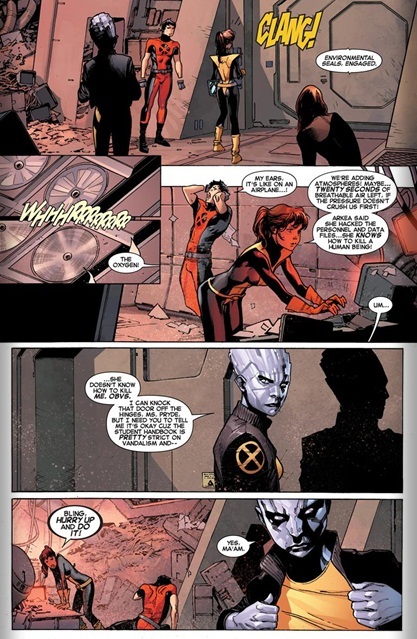 Considering she was having issues with controlling her need to feed and left the X-men to learn how to control said urges it’s strange that there is no mention of what she went through that made her this “latent vampire” who is in perfect control of her ferocity. Too easy- Mind you I know Arkea couldn’t possibly be dead but this opening arc was anticlimactic I how it built up and ended. All it took was Psylocke using her powers on her to end the threat? Arkea- The execution fell a bit shorts this issue. If the villain can take control of all technology she should have been a far bigger threat than what we encountered. The people outfitted with tech based components to live seemed like an untapped potential that just missed the proper execution bar. Here were these innocents that ethically the X-men should not kill and so they held back. Wood could have gotten mileage out of this but quickly wraps things up a little too neatly for my tastes.